Colonial Knot is sometimes called Figure Eight Knot and it is often used in candlewicking embroidery so is also called a Candlewicking Knot. This surface embroidery stitch at first glance looks very much like a French knot but it is worked slightly differently as you create the knot by looping the needle around the thread rather than wrapping the thread around the needle. To work Colonial Knot, bring your thread up through the fabric. Hold the thread in your left hand slightly loose. Start with your needle pointing away from you and to the left of the thread. 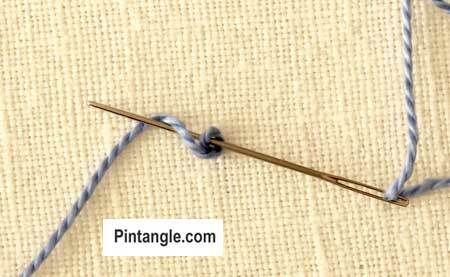 Slide the needle under the thread, towards the right then flip the needle over your thread. This loop can be formed in a hooking motion by turning the needle in anti-clockwise direction 180 degrees over the working thread so that the thread forms a figure 8 around the needle. Take the needle to the back of the fabric next where it first emerged but not in the same hole. Before you pull it through make sure the loop is snug around the shaft of the needle. Pull through and you have a colonial knot! Colonial knots take a bit if practice to create the knot, but once your hands understand the mechanics of the stitch, it is easy to work. 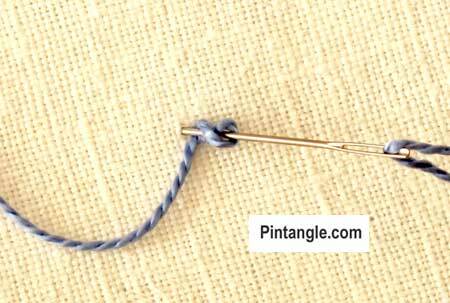 Many stitchers prefer this to French knots and find them quicker and easier to work. Colonial knots take up less thread that french knots too so they are economical on resources as well as time. They are great if you work them in silk ribbon and since silk ribbon is costly some people substitute Colonial knots for French knots when ever they work in silk. 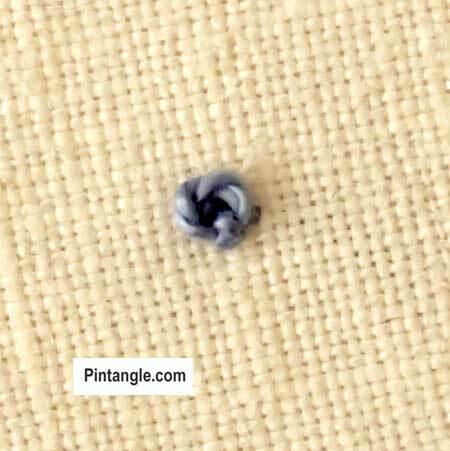 You can also work slightly thicker thread easily using this stitch it is after all used in candlewicking embroidery. Anyway enjoy leaning this stitch and make some comparisons yourself. patterns on fabric? I know that regular computer ink is indelible. participants. Thank you for doing it again. Thank you. This is a great explanation of how the stitch is made. I’m going to “practice” these on my current block.